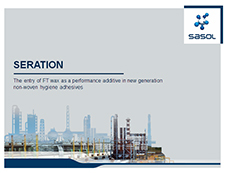 SERATION 1830 by Sasol is a Fischer-Tropsch wax for hygiene construction hot-melt adhesives. It has no color, odor and exhibits low surface energy, high crystallinity. It helps build up adhesion significantly faster and to a higher level. This thermally stable wax shows excellent substrate wetting. 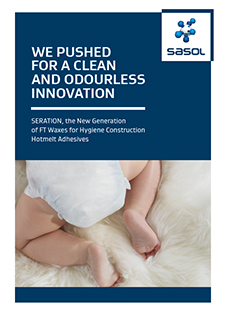 Compatible with all major groups of polyolefin polymers and tackifying resins. It allows adhesive formulators to optimize T-peel adhesive strength and spray temperature as per their need and polymer type. When using SERATION 1830 in POE formulations, the adhesive becomes sprayable at much lower temperature inspite of its lower viscosity. It works well at broad application temperature ranging from 130°C to 160°C.